Safe & Natural. Made by You. Platelet Rich Plasma (PRP) is a natural therapy that exploits the regenerative potential contained in our platelets, in order to induce tissue repair & new tissue generation. Platelet Rich Plasma (PRP) injections rely on a technique which is both simple and safe and which uses the regenerative and healing properties of platelets. Platelets have the ability to locally release autologous growth factors, small proteins that act as messengers to initiate the process of skin regeneration. From a small sample of blood, we isolate your platelets for the preparation of PRP Therapy. It takes approximately 10 minutes to prepare the PRP injection. PRP treatment is an all natural product prepared from your own blood. The natural aging of your skin is due to an imbalance between the rate of destruction and renewal of cells and collagen. By promoting the process of natural tissue regeneration, PRP improve skin quality and smoothes fine lines of the face, decollete and hands. 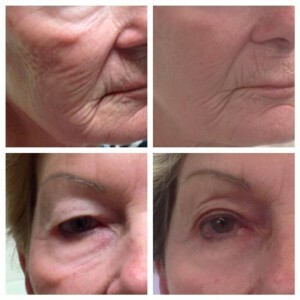 The rationale for A-PRP gel into wrinkles is different to injection of standard fillers.The concept is not to fill the wrinkles but to stimulate the fibroblasts to produce new collagen and other components of the extracellular matrix (including elastin, fibronectin, glycosaminoglycans, hyaluronic acid, glycoproteins and vitronectin). After an initial consultation. On the treatment day your blood will be drawn by a phlebotomist. Just like when you go in for a blood test at a doctors office.The blood will then be spun in a centrifuge to separate the platelet plasma from the red blood cells. Local injection of A-PRP is a great treatment for the improvement of deep acne scars, facial creases and wrinkles, dark circles around eyes, sun damage and stretch marks. Injection of A-PRP into the dermis supports, accelerates and increases tissue regeneration. A-PRP stimulates new collagen production.PRP also improves the elasticity, tone and thickness of the skin. The eye area is a particularly fragile region in which it may appear bluish coloration due to microcirculation disorder, sometime associated with a dark area under the lower eyelid. Growth factors present in a PRP treatment stimulate the micro-circulation around your eye. The skin brightness improves and skin around the eyes recovers its tonicity. Localized treatment by injecting a gel preparation of PRP restores harmony and proportions in the volumes of the face. Some common areas include Nasolabial folds, cheeks and jaws, periorbital areas, crows’s feet, nose and forehead. Come in for a free no obligation assessment to learn more about PRP Therapy treatments and if you are the right candidate to receive PRP Therapy.